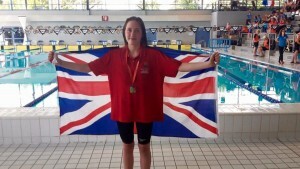 Our Salford trio of Jade Nuttall, Georgina Chadwick and Nathan Lowe have been in action in Beauvais, France representing the British Catholic Schools team at the World Catholic Schools Games. Competing nations included Malta Netherlands, Germany, France, Palestine, Hungary, Austria,Italy, Spain, Portugal,Brazil and Egypt. Nathan Lowe won gold in the 50 and 100 back and 4th in the 200 back. 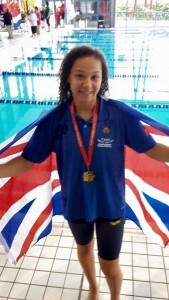 Jade Nuttall was Girls team captain and made the finals in the 50 free, 100 free, 100 fly. 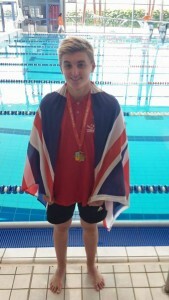 George Chadwick made the 50 and 100 fly finals and won Silver in the 200 fly. Our Salford trio also swam freestyle and medley relays. Nathan in the boys A team winning Gold. Jade in the girls A team getting Gold and Silver while George’s B team came 4th.